Disney Springs West Side offers some great entertainment and eating venues as well some interesting shops. If visiting the West Side, you can park in the Orange multi-story garage which gives direct access. There are also four open air parking lots just a few minutes walk away; namely Strawberry, Watermelon, Grapefruit and Mango. Disney Quest (closed on July 3, 2017) — an indoor interactive theme park spread across five floors that will particularly appeal to young kids and teenagers. You can choose from a number of high-tech games including virtual reality and classic video games. Some games have height restrictions. Separate paid admission required. House of Blues — a 2,000 seat concert hall offering live music, everything from gospel to rock ’n’ roll, latin, hip-hop, R&B, reggae and of course blues. Concert dates and ticket prices vary. Splitsville Luxury Lanes — a retro bowling alley with 30 lanes over two floors, billiard tables, indoor-outdoor dining, five bars including sushi, live music and dancing on Saturday evenings. Normal walk-up bowling prices start at $15 per person with early bird prices of $12 including shoe hire. 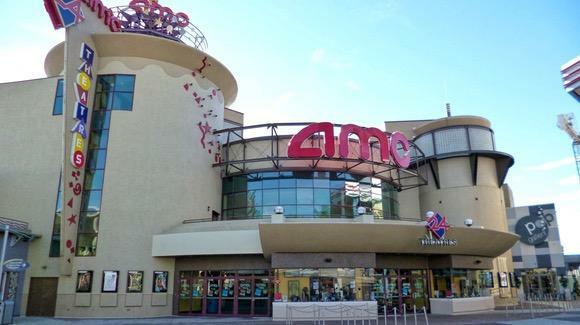 AMC Movies at Disney Springs 24 — watch the latest films at a state-of-the-art 24 screen cinema with rocker-style stadium seating including one with 3D technology. Six of the auditoriums offer “Fork & Screen” full-service dining and reserved seating. Aérophile: The World Leader in Balloon Flight — a tethered balloon flight up to a height of around 400 feet giving you a fantastic view of all of Disney Springs and the surrounding resort area. The ride lasts around 8 to 10 minutes and operates from 8:30 a.m. to 12:00 a.m. daily, weather permitting. Prices are $18 for adults and $12 for children. Most entertainment venues also offer food and drink. Crossroads at House of Blues — as well as the concert hall, there is also the table service restaurant and bar with a daily happy hour, a Gospel Brunch on Sundays and live blues music on Friday and Saturday late evenings. The Front Porch offers cocktails and live entertainment every night subject to the weather. Wolfgang Puck Grand Café — a fusion of Asian and Californian cuisine serving steaks and sushi. The upstairs Dining Room at Wolfgang Puck Grand Café offers signature dining. Bongos Cuban Café — enjoy Cuban inspired cuisine in a 1950s style Havana nightclub operated by Gloria and Emilio Estefan. Fork & Screen — dine-in seat-side service at the AMC Movies at Disney Springs 24. Planet Hollywood Observatory — Planet Hollywood has been converted into a themed turn-of-the-century brick-clad observatory. It retains its Hollywood film memorabilia but the interior ceiling has been converted into a planetarium. It was expected to re-open late 2016 with a new Stargazers bar and outdoor seating area but construction delays pushed the opening date back into early 2017. Amongst the counter service and kiosk offerings are Wetzel’s Pretzels, Häagen-Dazs, The Smokehouse, The Express at Wolfgang Puck Grand Café, Bongos Cuban Café Express, MacGUFFINS located inside the AMC Movies at Disney Springs 24 and Starbucks. World Showcase of Flavors — sample delights inspired by the Epcot International Food & Wine Festival including grilled chicken breast gyros and grass-fed beef sliders. Namaste Café — Asian cuisine from Disney’s Animal Kingdom including a naan and samosa dipping safari and lamb kefta. Fantasy Fare — treats from around the global Disney parks including Croque Monsieur from Disneyland Paris and hand-dipped corn dogs from Disneyland California. Superstar Catering — American cuisine from Disney’s Hollywood Studios including flatbreads and shrimp and lobster with macaroni and cheese. They generally open around lunchtime. West Side has an eclectic mix of shops including Fit2Run, Curl by Sammy Duvall, Memory Lanes, Pop Gallery, Something Silver, Sosa Family Cigars, United World Soccer, Sunglass Icon, Disney’s Candy Cauldron, Star Wars Galactic Outpost and Orlando Harley Davidson. Most of the entertainment venues and restaurants also have gift shops.